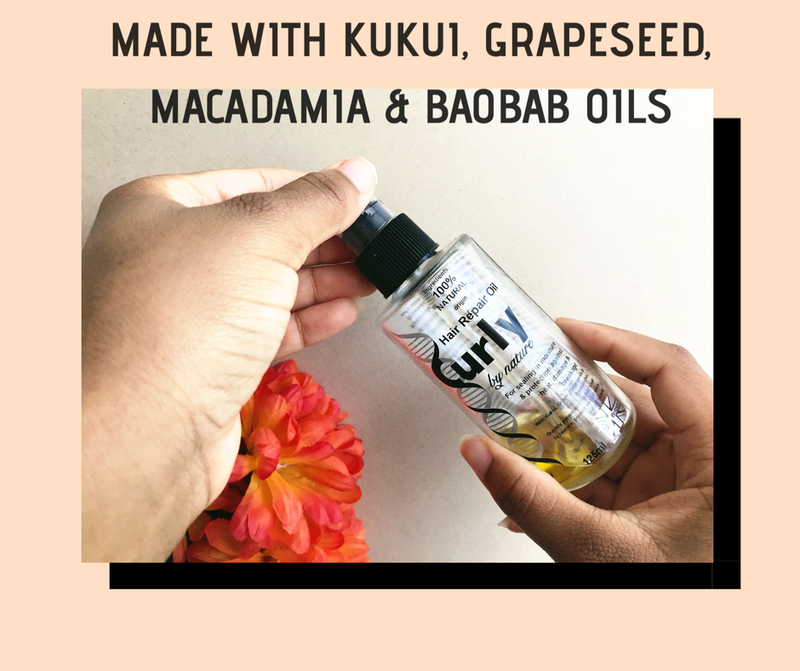 A while back I was approached by Klerissa McDonald, founder of Curly By Nature to try out a few of her natural hair products and to share my thoughts with you on my blog. I have volunteered my strands to try out something new, as always my thoughts and opinions on the products received are my own. 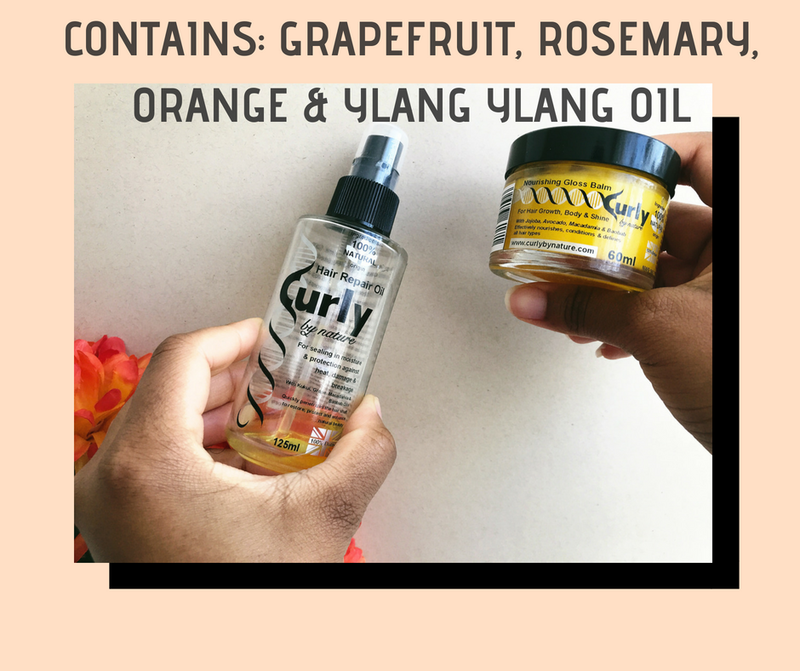 I was first introduced to Curly By Nature at last years Black Girl Festival, where Klerissa was on the natural hair panel discussing texture discrimination and the natural hair community. 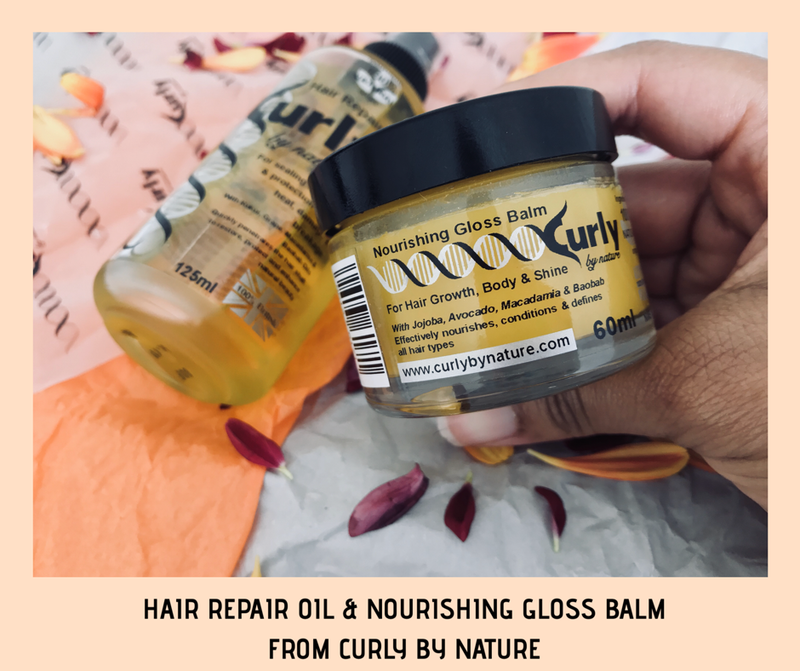 I was generously sent Curly By Nature’s Hair Repair Oil & Nourishing Gloss Balm. 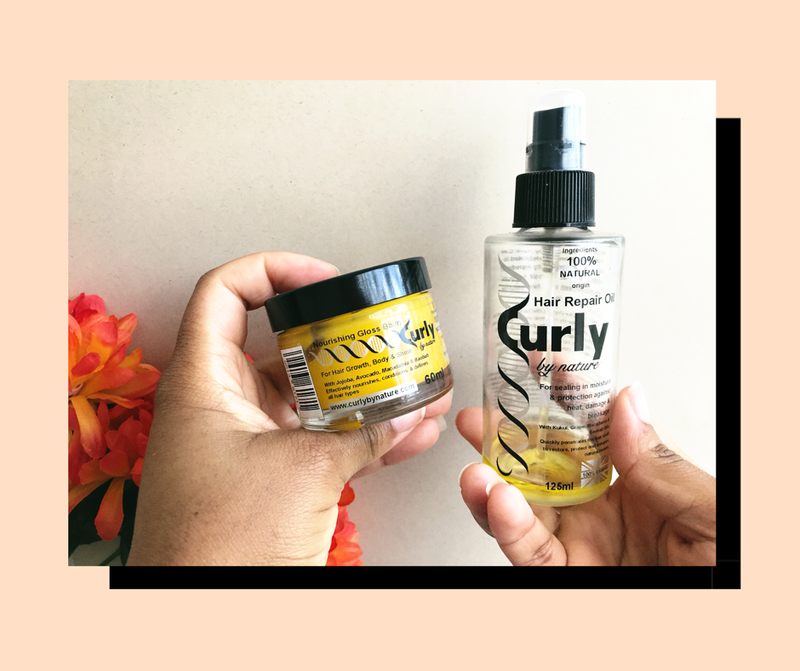 I found that these two products are heavily oil based, which is great for adding plenty of moisture to my hair and all of Curly By Nature’s products are made here in the UK. Created to help seal in moisture and protect against heat damage and breakage. This 100% natural blend of oils quickly penetrates the hair shaft to restore, protect and enhance natural beauty. Considering this oil is made using a blend of sixteen different types of oils (if I counted correctly) it is very light. It does an amazing job of sealing in all of the moisture without weighing my hair down, or creating loads of buildup. I was really pleased with how well this oil worked with my other products. Initially I wasn’t too sure about the smell, but that’s because I couldn’t identify the scent. I couldn’t tell you what the smell of the oil reminds me of nor could I name an oil in this mix just by smell. The balm for hair growth, body & shine. This smooth and almost buttery textured balm effectively nourishes, conditions and defines all hair types. Recently I have only been using my balms as a sealant instead of a full on moisturiser. 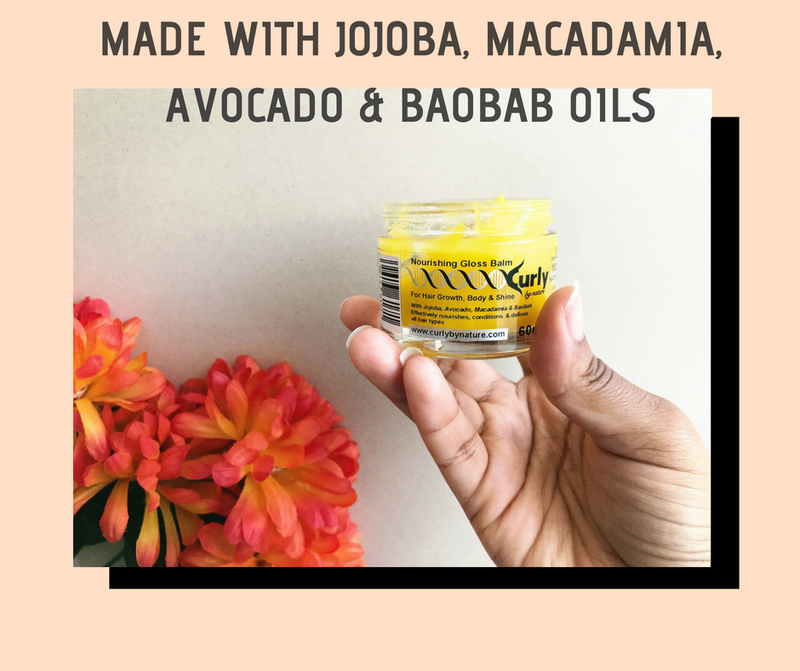 Balms tend to be oil and butter based and my hair responds better to water based products, so a nice smooth oily balm works really well to keep all the moisture locked in. It is recommended that you use a pea sized amount, on damp hair, but I have only used it on damp hair once. I definitely noticed a difference from when I used it on dry hair. When I used the nourishing gloss balm on dry hair it didn’t do much other than giving my hair some shine, which doesn’t compare to the shine my hair had when I used it on damp hair. As the name suggests it does give you a really nice, healthy shine and generally just made my hair look healthier. It should be noted that the Nourishing Gloss Balm works well on your scalp and when your hair is in braids or twists, which is good to know because I will be putting my hair in some braids soon. I did use a small amount to give my hair a scalp massage and it did help to relive the slight itching I had and it helped to keep my hair moisturised up until wash day. Overall these two products work really well as sealants. After having a look through the ingredients, I believe the scent is due to the mix of oils in the products. It creates a natural, earthy but sweet scent, the nourishing gloss balm smells edible. Out of the Hair Repair Oil and Nourishing Gloss Balm, I would purchase the oil as I know I will get a lot of use out of it. The gloss balm however works really well, but I don’t feel like I would reach for it often enough, as much as my current favourite balm. I will continue to use the Nourishing Gloss Balm and share more of my thoughts with you on my instagram. My experience with both the Hair Repair Oil and Nourishing Gloss Balm has been a good one, my hair and scalp has responded well to the ingredients. The products themselves are not too heavy or overly greasy and I love the fact that these products are so natural. If you’re sensitive to proteins and/or rubbish ingredients then using natural products like the ones Curly By Nature makes are great for avoiding irritation. Generally a pleasant experience with these products, I have rated my overall experience a 4 out of 5 because I feel like I got more use out of the oil than the balm. The price of these two products are higher than some of the other products I have used, but once I had a look through the ingredients I understood that the more natural and raw the ingredient’s used, the higher the price of the item, especially if the ingredients are quality. So If you don’t mind spending a little bit more on some hair products you know are full of goodness then I would suggest giving Curly By Nature a try.